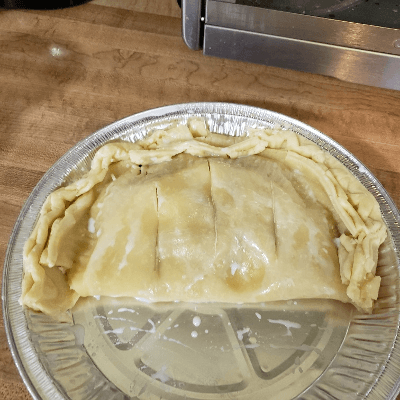 Okay, so I had some frozen pie crusts and got one of those out to thaw. I can make pie crust, but I had bought these for some reason and they won’t keep forever, even frozen. ANYWAY, I had also bought many mushrooms. The grocery probably had a sale. And I love mushrooms. So I cooked those in a dry pan to concentrate the flavor. Salt. Penzeys Sunny Paris seasoning.Then I added some vegan margarine and a little flour to make a roux and used white wine for my liquid to made just a wee little bit of sauce. 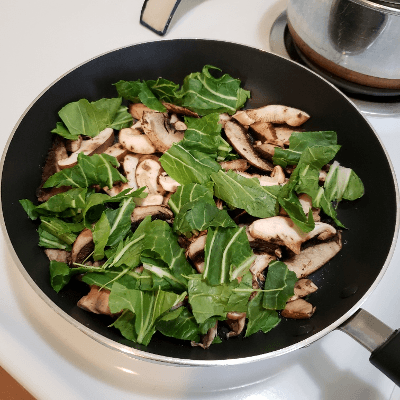 I thought some spinach would be good in it, but I didn’t have any spinach, and I did have some bok choi, so I cut up some bok choi greens and used that. The part of Spinach is being played by bok choi greens. 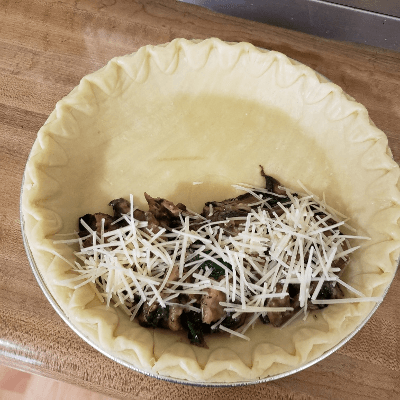 Filled half the pie shell with the cooked filling and added some shredded cheese. If I had had some Daiya vegan shredded cheese, I would have used that. I folded the crust over and mooshed it down. Cut some slits for the moisture to escape. Brushed it with milk, although water would have done. Baked it according to the pie shell package directions and YES, it was GOOD! I’m posting today at Fatal Foodies about some li’l baby burritos we had another day. A WRITING PROMPT FROM ME TO YOU: Have you read LIFE OF PI? Do you prefer the story with animals, or the story with people? This entry was posted in Food. 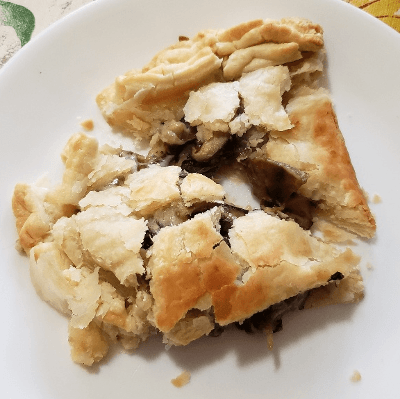 Tagged mushrooms, Pi Day, savory pie, vegetarian. LOL! This wasn’t a SWEET pie,it was a savory pie. Like a chicken pot pie without the chicken.